MyFRITZ! Accesses allow you to use any web browser to access browser-based applications in the FRITZ!Box home network, such as a web server or graphic interface of a NAS system, over the internet at any time. In this case, the FRITZ!Box's firewall continues to protect your home network from unwanted data from the internet. The server service must be reachable via a URI scheme (Uniform Resource Identifier), for example via http or ftp. Register a MyFRITZ! account and set it up in the FRITZ!Box. Enable the option "Maintain permanently (recommended for flat rates)". 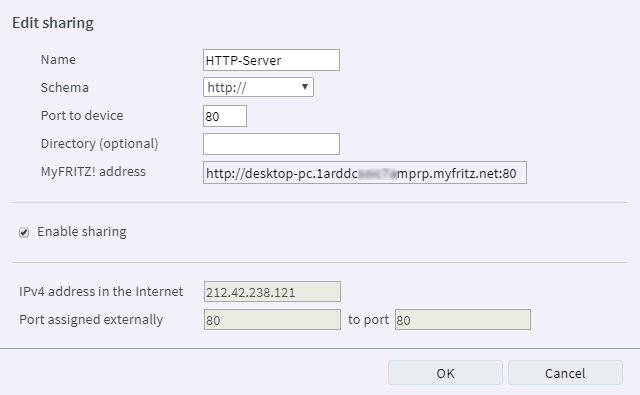 If the option is not shown, then the FRITZ!Box is already permanently connected to the internet. Determine the port the server service uses to accept incoming connections. Refer to the manufacturer for this information, for example consult the manual. Configure the computer's firewall according to the manufacturer's instructions so that the server service can be accessed from the FRITZ!Box home network and the internet. Click "Permit Access" in the "Internet" menu. Click on the "Port Sharing" or "Port Forwarding" tab. Click "Add Device for Sharing". Select the (computer) name of the device from the drop-down list "Device". Note:If you cannot select the device, then you can select "Enter the IP address manually" and enter the IP address. Only devices that automatically obtain their IP settings (DHCP) from the FRITZ!Box are listed in the drop-down list. Enable the option "MyFRITZ! Access". If you want to set up the access for an HTTP server, HTTPS server, or FTP server, select the corresponding server service from the "Application" drop-down list. Select the entry "Other application". Enter a name of your choice for the sharing in the "Name" field. Select the internet protocol for accessing the server service from the "Scheme" drop-down list. If you want to configure a sharing for a different internet protocol, select "Manual entry" and enter the access scheme (for example "ftps://"). Under "Port to device", enter the number of the port on which the server service will listen for incoming connections from the internet. Enter a directory in the "Directory (optional)" field (for example \\Folder1\Folder2\) if required by the server service. Now the MyFRITZ! access is set up and you can use an access link in the overview of devices on myfritz.net to access your server service. The MyFRITZ! address that allows you to directly access the server service from the internet is also shown in the detailed information given for the respective network device under "Internet > Permit Access > Port Sharing" in the FRITZ!Box user interface.